Oct. 29, 2008 -- Dr. Bettye Collier-Thomas, scholar and civil rights authority, is the featured lecturer in the fifth event of Arkansas State University’s Lecture-Concert Series, ASU's annual Corinne Sternheimer Greenfield Lecture. She will present “The Nexus: Women, Religion, Race, and Civil Rights” on Tuesday, Nov. 11, at 7 p.m. in the ASU Student Union Auditorium, 101 N. Caraway Road, Jonesboro. This event, like all events in the Lecture-Concert Series, is free and open to the public. Dr. Collier-Thomas is a professor of history and director of the Temple University Center for African American History and Culture. This year, Dr. Collier-Thomas is also a residential Fellow at the Woodrow Wilson International Center for Scholars in Washington, D.C., where the subject of her research is African American women and politics. 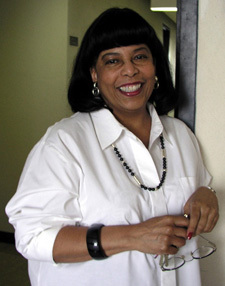 As the founding executive director of the Bethune Museum-Archives, she developed the nation's first museum and archives for black women's history, situated in the Mary McLeod Bethune Council House National Historic Site, in Washington, D.C. As special consultant to the National Endowment for the Humanities, she developed the agency's first program of technical assistance to black museums and historical organizations. Dr. Collier-Thomas is a nationally known scholar, whose current publications include “Sisters in the Struggle: African-American Women in the Civil Rights-Black Power Movement;” “My Soul Is a Witness: A Chronology of the Civil Rights Era 1954-1965;” “Daughters of Thunder: Black Women Preachers and Their Sermons, 1850-1979;” and “A Treasury of African American Christmas Stories.” She is currently directing research and preparing to write the first comprehensive history of African American women and the church from 1780-1970. This monumental project is being funded by the Lilly Endowment. Dr. Collier-Thomas has served on the faculties of Howard University, the Washington Technical Institute (University of the District of Columbia), and the University of Maryland, Baltimore County. The presentation is funded by Drs. Rosalee and Raymond Weiss of Teaneck, New Jersey, in memory of Dr. Rosalee Weiss's mother, Corinne Sternheimer Greenfield, through an endowment supporting an annual lecture in the ASU College of Humanities and Social Sciences. For more details, contact Dr. Carol O’Connor, associate dean of the College of Humanities and Social Sciences, at (870) 972-3973, via e-mail at coconnor@astate.edu.Visit http://asunews.astate.edu/L-CFlyerGENERALrel08.htm.astate.edu for a complete listing of the 2008-09 Lecture-Concert Series programs and a printable flyer.